Grinding wheels are made of natural or synthetic abrasive minerals bonded together in a matrix to form a wheel. While such tools may be familiar to those with home workshops, the general public may not be aware of them because most have been developed and used by the manufacturing industry. In this sector, grinding wheels have been important for more than 150 years. For manufacturers, grinding wheels provide an efficient way to shape and finish metals and other materials. Abrasives are often the only way to create parts with precision dimensions and high-quality surface finishes. Today, grinding wheels appear in nearly every manufacturing company in the United States, where they are used to cut steel and masonry block; to sharpen knives, drill bits, and many other tools; or to clean and prepare surfaces for painting or plating. More specifically, the precision of automobile camshafts and jet engine rotors rests upon the use of grinding wheels. Quality bearings could not be produced without them, and new materials such as ceramic or material composites would be impossible without grinding wheels to shape and finish parts. Sandstone, an organic abrasive made of quartz grains held together in a natural cement, was probably the earliest abrasive; it was used to smooth and sharpen the flint on axes. By the early nineteenth century, emery (a natural mineral containing iron and corundum) was used to cut and shape metals. However, emery's variable quality and problems with importing it from India prior to its discovery in the United States prompted efforts to find a more reliable abrasive mineral. By the 1890s, the search had yielded silicon carbide, a synthetic mineral harder than corundum. Eventually, manufacturers figured out how to produce an even better alternative, synthetic corundum or aluminum oxide. In creating this bauxite derivative, they developed an abrasive material more reliable than both natural minerals and silicon carbide. Research into synthetic minerals also led to production of the so-called superabrasives. Foremost in this category are synthetic diamonds and a mineral known as cubic boron nitride (CBN), second in hardness only to the synthetic diamond. Today, development continues, and a seeded-gel aluminum oxide has just been introduced. Throughout the grinding wheel's history, the bond that holds the abrasive grains together has proven as important as the grains themselves. The success of grinding wheels began in the early 1840s, when bonds containing rubber or clay were introduced, and by the 1870s a bond with a vitrified or glass-like structure was patented. Since then, bonds used in grinding wheels have been continually refined. Grinding wheels are available in a wide variety of sizes, ranging from less than .25 inch (.63 centimeter) to several feet in diameter. They are also available in numerous shapes: flat disks, cylinders, cups, cones, and wheels with a profile cut into the periphery are just a few. Although many techniques, such as bonding a layer of abrasives to the surface of a metal wheel, are used to make grinding wheels, this discussion is limited to wheels composed of vitrified materials contained in a bonding matrix. To make a grinding wheel, the ingredients must first be mixed together. Some manufacturers simply mix all materials in a single mixer. Others use separate steps to mix abrasive grains with binder, transfer the wet abrasive to a second mixer containing the powdered bonding materials, and tumble the mixture. Next, the wheel is formed in a molding step: the ingredient mix is poured into the mold and compacted by a hydraulic press. Two important components, abrasive grains and bonding materials, make up any grinding wheel. Often, additives are blended to create a wheel with the properties necessary to shape a particular material in the manner desired. Abrasive grains constitute the central component of any grinding wheel, and the hardness and friability of the grinding materials will significantly affect the behavior of a given wheel. Hardness is measured in terms of a relative scale developed in 1812 by a German mineralogist named Friedrich Mohs. On this scale, extremely soft talc and gypsum represent hardnesses of one and two, and corundum and diamond represent hardness of nine and ten. Friability refers to how easily a substance can be fractured or pulverized. People who design grinding wheels consider the friability of their abrasives—which can differ with the nature of the materials being ground—very carefully. For example, while diamond is the hardest known material, it is an undesirable steel abrasive because it undergoes a destructive chemical reaction during the cutting process; the same is true of silicon carbide. On the other hand, aluminum oxide cuts irons and steels better than diamond and silicon carbide, but it is less effective for cutting nonmetallic substances. If selected correctly, an abrasive chosen to shape a particular substance will retain its friability when ground against that substance: because the grinding will cause the abrasive to continue fracturing along clean, sharp lines, it will maintain a sharp edge throughout the grinding process. This gives the grinding wheel the unique characteristic of being a tool that sharpens itself during use. Although bonded abrasives began as tools made from natural minerals, modern products are made almost exclusively with synthetic materials. A bonding material holds the abrasive grits in place and allows open space between them. Manufacturers of grinding wheels assign a hardness to the wheel, which should not be confused with the hardness of the abrasive grain. Bonds that allow abrasives grains to fracture easily are classified as soil bonds. Bonds that restrict the fracturing of the grains and allow a wheel to withstand large forces are classified as hard bonds. Generally, soil wheels cut easily, produce poor surface finishes, and have a short useful life. On the other hand, harder wheels last longer and produce finer surface finishes, but cut less well and produce more heat during grinding. The bonding matrix in which the abrasive grains are fixed may include a variety of organic materials such as rubber, shellac or resin; inorganic materials such as clay are also used. Inorganic bonds with glass-like or vitreous structures are used on the tool-sharpening wheels for the home workshop grinder, while resin bonds are used in masonry or steel-cutting wheels. Generally, vitrified bonds are used with medium to fine grain sizes in wheels needed for precision work. Resin bonds are used generally with coarse grains and for heavy metal removal operations such as foundry work. In addition to their abrasive and bonding materials, grinding wheels often contain additional ingredients that produce pores within the wheel or assist chemically when a particular abrasive is used to grind a special material. One important aspect of a grinding wheel that can be created or altered through additives is porosity, which also contributes to the cutting characteristics of the grinding wheel. Porosity refers to the open spaces within the bond that allow room for small chips of metal and abrasive generated during the grinding process. Porosity also provides pathways that carry fluids used to control heat and improve the cutting characteristics of the abrasive grains. Without adequate porosity and spacing between abrasive grains, the wheel can become loaded with chips and cease to cut properly. A variety of products are used as additives to create proper porosity and spacing. In the past, sawdust, crushed nut shells, and coke were used, but today materials that vaporize during the firing step of manufacturing (for example, napthaline-wax) are preferred. Some grinding wheels receive additional materials that serve as aids to grinding. These include sulfur and chlorine compounds that inhibit microscopic welding of metal particles and generally improve metal-cutting properties. Most grinding wheels are manufactured by the cold-press method, in which a mixture of components is pressed into shape at room temperature. The details of processes vary considerably depending upon the type of wheel and the practices of individual companies. For mass production of small wheels, many portions of the process are automated. 1 Preparing the grinding wheel mixture begins with selecting precise quantities of abrasives, bond materials, and additives according to a specific formula. A binder, typically a water-based wetting agent in the case of vitrified wheels, is added to coat the abrasive grains; this coating improves the grains' adhesion to the binder. The binder also helps the grinding wheel retain its shape until the bond is solidified. Some manufacturers simply mix all materials in a single mixer. 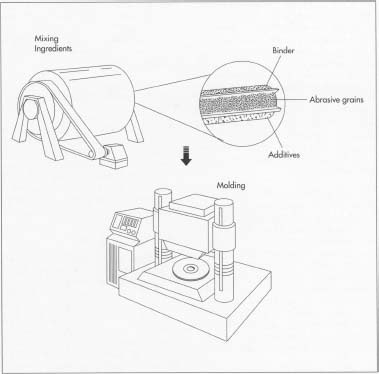 Others use separate steps to mix abrasive grains with binder. Wheel manufacturers often spend considerable effort to develop a satisfactory mixture. The blend must be free-flowing and distribute grain evenly throughout the structure of the grinding wheel to assure uniform cutting action and minimal vibration as the wheel rotates during use. This is particularly important for large wheels, which may be as big as several feet in diameter, or for wheels that have a shape other than the familiar flat disk. After molding and final shaping, the wheel is fired in an oven or furnace. Firing melts the binder around the abrasives and converts it to a form that will resist the heat and solvents encountered during grinding. 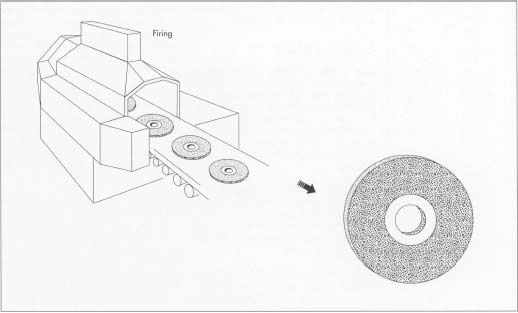 Finishing steps that follow firing may include reaming the arbor (center) hole to the proper size, correcting the thickness of the wheel sides, balancing the wheel, and adding labels. circular plates with diameter and arbor hole sizes equal to those of the wheel. A variety of methods are used to distribute the mixture evenly. Typically, a straight edge pivots about the center arbor pin to spread the mixture throughout the mold. 3 Using pressures in the range of 100 to 5000 pounds per square inch (psi) for 10 to 30 seconds, a hydraulic press then compacts the mixture into the grinding wheel's final shape. Some manufacturers use gage blocks between the two face plates to limit their movement and establish uniform thickness. Others control wheel thickness by closely monitoring the consistency of the mix and the force of the press. 4 After the mold has been removed from the press and the wheel stripped from the mold, the wheel is placed on a flat, heatproof carrier. Final shaping of the wheel may take place at this time. All work at this stage has to be done very carefully because the wheel is held together by only the temporary binder. Lighter wheels can be lifted by hand at this stage; heavier ones may be lifted with a hoist or carefully slid on a carrier to be transported to the kiln. 5 Generally, the purposes of the firing are to melt the binder around the abrasives and to convert it to a form that will resist the heat and solvents encountered during grinding. A wide range of furnaces and kilns are used to fire grinding wheels, and the temperatures vary widely depending upon the type of bond. Wheels with a resin bond are typically fired at a temperature of 300 to 400 degrees Fahrenheit (149 to 204 degrees Celsius), and wheels with vitrified bonds are fired to temperatures between 1700 and 2300 degrees Fahrenheit (927 to 1260 degrees Celsius). 6 After firing, wheels are moved to a finishing area, where arbor holes are reamed or cast to the specified size and the wheel circumference is made concentric with the center. Steps may be necessary to correct thickness or parallelism of wheel sides, or to create special contours on the side or circumference of the wheel. Manufacturers also balance large wheels to reduce the vibration that will be generated when the wheel is spun on a grinding machine. Once wheels have received labels and other markings, they are ready for shipment to the consumer. There are no clear performance standards for grinding wheels. With the exception of those containing expensive abrasives such as diamonds, grinding wheels are consumable items, and the rates of consumption vary considerably depending on application. However, a number of domestic and global standards are accepted, voluntarily, by manufacturers. Trade organizations, which represent some manufacturers in the highly competitive U.S. market, have developed standards covering such matters as sizing of abrasive grains, labeling of abrasive products, and the safe use of grinding wheels. The extent to which grinding wheel quality is checked depends upon the size, cost, and eventual use of the wheels. Typically, wheel manufacturers monitor the quality of incoming raw materials and their production processes to assure product consistency. Special attention is given to wheels larger than six inches in diameter, because they have the potential to harm personnel and equipment if they break during use. Each large vitrified wheel is examined to determine the strength and integrity of the bonding system as well as the uniformity of grain through every wheel. Acoustical tests measure wheel stiffness; hardness tests assure correct hardness of bonds; and spin tests assure adequate strength. Changes in manufacturing practices will determine the demand for various types of wheels in the future. For example, the trend in the steel industry towards continuous casting as a way to make steel has greatly reduced that industry's use of some types of grinding wheels. A push for greater productivity by manufacturers is responsible for market projections showing a shift from wheels made of traditional aluminum oxide abrasives to wheels made of newer forms of synthetic abrasives such as the seeded-gel aluminum oxide and cubic boron nitride. Also, the use of advanced materials such as ceramics and composites will increase demands for newer types of grinding wheels. The transition to new abrasive minerals, however, is being impeded by the fact that much manufacturing equipment and many industrial procedures are still unable to make effective use of the newer (and more expensive products). Notwithstanding trends, traditional abrasives are projected to continue serving many uses. However, competition from several alternative technologies is likely to grow. Advances in cutting tools made of polycrystalline superabrasive materials—fine grain crystalline materials made of diamond or cubic boron nitride—will make such tools a viable option for shaping hard materials. Also, advances in the chemical vapor deposition of diamond films will affect the need for abrasives by lengthening the life of cutting tools and extending their capabilities. Borkowski, J. Uses of Abrasives & Abrasive Tools. Prentice Hall, 1992. Burkar, W. Grinding & Polishing. State Mutual Book & Periodical Service, 1989. Hahn, Robert S. Handbook of Modern Grinding Technology. Chapman & Hall, 1986. Salmon, Stuart C. Modern Grinding Process Technology. McGraw-Hill, 1992. Murray, Charles J. "Retainer System Eases Wheel and Blade Replacement." Design News. January 18, 1988, p. 104. I would like to know the technology and which material is used for making of abrasive wheels please send me the names of materials for the purpose of mine. I would like to know the which materials are used for making of abrasive wheels, please send me the names of materials for the purpose of mine.